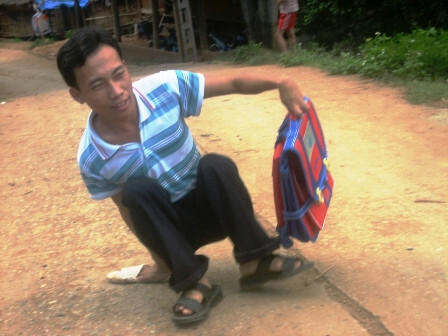 To pursue his schooling a disabled student in central Thanh Hoa Province has had to crawl to school using his hands. 18-year old Sung A De, who attends Continuing Education Centre in Muong Lat District, a mountainous region, is now in the 12th grade. A De’s small, tottery house is located at on a hill side in Suoi Hoc Hamlet, Trung Ly Commune. Children here often stop attending school around the 5th grade to help their parents earn money by doing farm work or collecting firewood. A De was born with a malformation of his legs due to exposure to Agent Orange, through his farther. As he got older, his legs continued to get smaller. Today they are entirely paralysed. Luckily, his hands and arms still function normally. This is how he get himself around. Because of his disability, A De could not work in the fields, so instead did small chores around the house to help out. Seeing friends his age go to school every day fostered the boy’s thirst for education, however his parents insisted that he stay home at first. Finally it was the young man’s determination that persuaded his parents to allow him to go to school. His father set up a hut near the school in order to shorten the distance he had to travel to class. A De had to live away from his family and crawl to the school on his hands. He also did his best to get through his daily activities without the help of his parents. On rainy days, he sometimes fell because of the road’s slippery conditions, showing up to school with scratches on his face. His willpower propelled him to continue on to the high school he currently attends, although it is 60km from his home and family. His parents can only see him once several months, so the majority of the help he gets comes from teachers and friends. He also receives small subsidy of VND140,000 (USD7) per month.